My Aunt Ruth kept a delicious beverage in her fridge that we kids called Jungle Juice. She made it from leftover iced tea and fruit juices. There was never a written recipe because her delightful concoction was made from whatever was available at the time. Over the weekend, I came across a recipe in a self published cookbook called “Ruth Owen’s Fruit Tea”. It sounded a lot like Aunt Ruth’s Jungle Juice, so, I decided to give it a try. 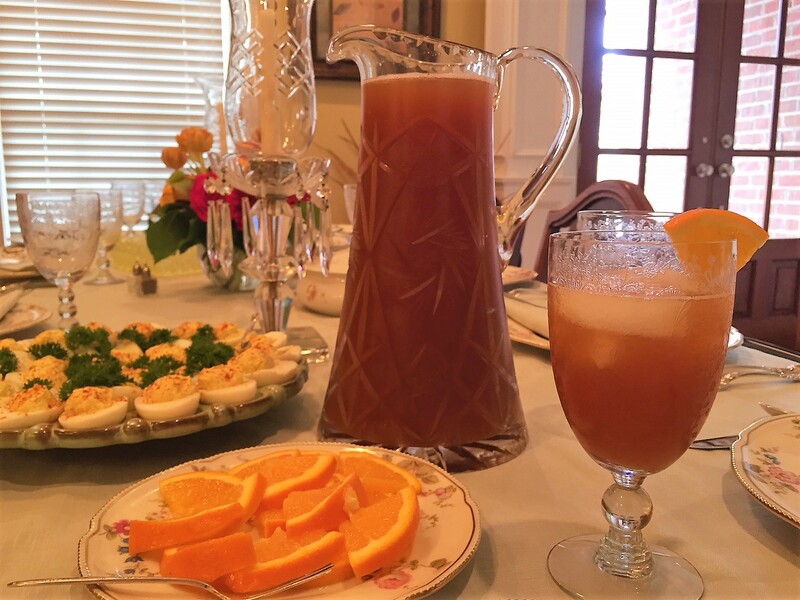 I served it to my guests for Easter lunch which was a big hit with not a drop left in the crystal pitcher at the end of the meal. But, no need for anything fancy. Aunt Ruth’s was kept in a plastic pitcher in the fridge for any thirsty soul who happened by. Bring 2 cups of water to a boil. Turn off, add tea bags, and steep for 15-20 minutes. In a gallon pitcher combine warm steeped tea and sugar. Stir until sugar is dissolved. Add 8 cups water and juices. Chill and serve. Garnish with lemon or orange wedges if desired.